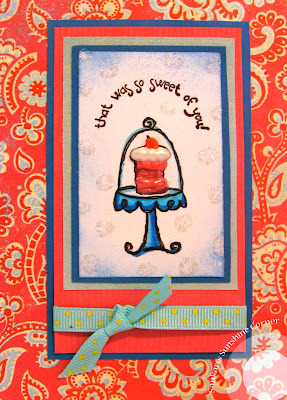 Here is a card that I made for the Our Creative Corner Challenge - Brads and Buttons. The inspirations for this card came from: Dawn Easton and Maria whose cards I CASED. Before I continue with the card - I would just like to take a moment to thank Maria for being so sweet and welcoming. Way before I even had a blog, I would pop onto Maria's for a little inspiration and was always amazed by her crafts and more than that who she was. She has always been so open and so encouraging in her emails - she is just the sweetest sweetheart and a wonderful person. Thank you so much Maria! As my son would say: "You are just so tweet". So go on over to Maria's site and check out her cards! 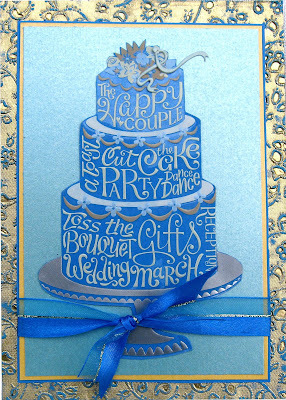 As to this card - I have to admit - it all started when I saw the paper -(Sparkle Cat Circles - from Cloud 9 designs). I just loved it! and then I remembered that I had some brads that matched, and then I found some buttons that would go and then I saw some ribbon that could tie it all together (all of these elements are from MakingMemories). I love how the brads look like buttons (these are epoxy buttons). As for the sentiments - the Thank You , I think is from MSF! - but I am not sure because I didn't keep the packaging - will have to check on that. I can't wait to see what new challenges they have today at the OCC. Hope you are all enjoying a sunny saturday! It was a really fun combination of colors and the card itself was a fun card to make. The color combination made me think of red flowers in the earth against a beautiful sky - so I went with that. The stamps for this I think are from MSF!, I am not sure because I got this stamp set a while ago and kept the clear stamps in a folder without labeling where it was from - (I have since learned that lesson). Can't wait to get some TCP stamps and see what the next challenge is :) I have to say - its really fun to do these challenges because the have made me use colors and combinations that I hadn't thought of before - and its great to see all the cards that all the other amazing crafters have made! Hope all of you are well and happy and healthy! 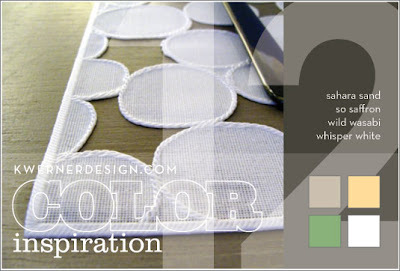 Time for another Color Inspiration Challenge from Kristina Werner - this time the five colors are: Whisper White, Purely Pomegranate, Regal Rose, Wild Wasabi and River Rock. Its interesting how these challenges make me actually post a card... and keep the creative fun juices going :). Here is a fun little card that I made for our friend's housewarming (which was today but we couldn't make it because our daughter who has been sick with fever this week is just starting to turn the corner - knock on laminated wood :). But I hope they all had fun. well - wishing all of you a great night and sweet dreams! 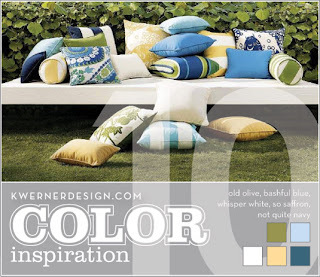 Its time for another color challenge from Kristina Werner. This time the challenge had four colors : Whisper White, Sahara Sand, So Saffron and Wasabi Green. I have to say it was a little bit of a hard challenge - just the combination of colors and all... but one thing that I have noticed in doing these challenges, is that I make cards that are outside my box - although I don't really know what my box is.... Anyhow - I have to say I liked how the card turned out - I was trying to follow the design of the placemat from the picture - with just little pops of color from the flowers. It's kinda fun to work with circles - I just wanted to keep cutting circles out - (the Cutting System from Creative Memories is awesome for circle cutting...) and the little flowers are just so cute and sweet. I guess maybe - just that I think a little bit more of the design of the card then just throwing things together. Anyhow... the only stamp is the sentiment Congratulations, which is from G Studio stamps (only a $1 at AC Moore - Holla!). All the papers are from my scrap pile -not sure from where - the only one I know is the Sahara Sand look alike is from American Traditional Designs and I love this DP - its so nice - feels so good and is double sided cardstock with beautiful vines on the back. The flowers and pearl embellishments are from Kaiser Scrapbook - they are both lovely and delicious. I really do look forward to these challenges - can't wait till the next one! Hope all of you are well and are enjoying this beautiful weekend! It was definitely fun, especially using the Going Out in Style stamp set by Stampin Up! The hat on her head originally was a different had - so I had to stamp twice - cut the hat out and put the other hat instead - so I could tie the bow on - which was the prominent feature on TCP challenge. I love this stamp set - I think I need to use it more. I hope they like it too. It was so much fun to go to the reception and see my cousins whom I haven't see in forever... and for them to finally meet our kids and vice versa. It seems these days that everybody is spread out all over the place and its so hard to coordinate a family reunion ... esp in my family. After road tripping across 7 states from Iowa to Maryland with two little ones under the age of 3 - we finally made it to my parent's house happy and relieved. We have been here in Baltimore this last week for my father's surgery. I cannot even tell you how intense this week has been - but everyone has had their sweet attention on my dad and thanks to that - he came through the operation ok (for an aortic aneurysm with a double bypass on the femoral arteries). Thanks to everyone's prayers and good wishes he is doing fine. And he got to come home today!!!! YAY! I am so grateful for every little thing. It is so good to finally see him home without any tubes or wires - sigh - what a huge relief. I love Ikea - I got lost in there for a week once - just always came out filled with ideas. So here is my take on her challenge. Hope its ok. I just realized how hard it is to photograph a picture and have it feel true to life - I finally took my card outside and set it in the grass and tried it with the sunlight - which felt more apt since the card was filled with butterflies. I love these color challenges because they make you think in a different way than you usually think - and makes you try and play with the space a little differently. I feel so recharged after making a card - phew! I needed that - its so amazing how doing something creative can cause all the endorphins to rush around and create little tiny bubbles of bliss cruising around your body :) Wow - I think I will have to find a nook here to unpack my craft pack and make a card every day to post. Can't wait to see the Round Up on Kristina's blog and also the next MACM on Youtube Hope all of you are well. We Made IT!!! Yay! After 2 days in the car together, we arrived safely in Baltimore. It was really a great trip overall - I was actually surprised at how well the kids did on such a long trip (they are 3 yrs and 1yr). On Friday when we left, we were just ahead of a severe storm system. In front of us the sky was sunny and behind us the sky was dark and cloudy. This is the same system that has caused the severe flooding in Indiana, which is where we stopped last night to break our trip in two (last night the weather was windy but not raining yet). We visited my Alma Mater Earlham College, in Richmond, Indiana. It was so sweet to see our little ones walking on the path that I used to walk on my way to class. I showed my son my old dorm room and where I used to eat and showed him some of my classrooms. He was kinda fascinated and asked some cute questions. It was really nourishing to be there with my husband and family - somehow integrated the whole college experience with who I am today. We left early this morning and drove across five states! It was fun to show where we where on a map to our son and everytime we crossed a state line we would yell the name of the state and blow a kiss to the ceiling. We stopped a few times to let the kids run around and kick a soccer ball - I think that helped them feel a little bit more settled in the car. I was so excited when I saw the "Welcome to Maryland" sign! My parents were so happy to see us and we were so happy to see them. It was 96 degrees today - can you believe it?! 10 minutes after we arrived, the kids were running through the sprinkler in their bathing suits - they had so much fun - a great way to unwind from a long journey! We had some yummy south indian cooking and are settling in for the night. So good to be home finally! Here is a card that I made last week that celebrates friendship from the SU set The World Over. It is such a cute set and the sentiment and images are so sweet. 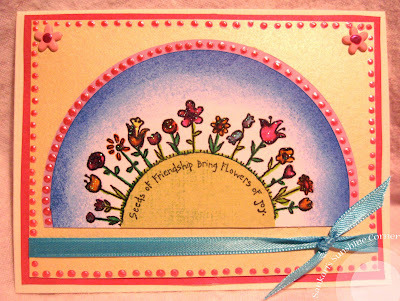 The sentiment reads: "Seeds of Friendship bring flowers of Joy." The card was stamped twice once on white cardstock and then again on green. The green portion was cut out and then paper pieced onto the white cardstock. I cut a semi-circle around the image and daubbed a light and dark blue on the edges. And then finished the card off with matting it onto the background paper and tying a ribbon. I dedicate this card to all of my friends -both new and old. You have all brought so much joy into my life and teach and inspire me everyday to be the best person I can be.... Thank YOU! 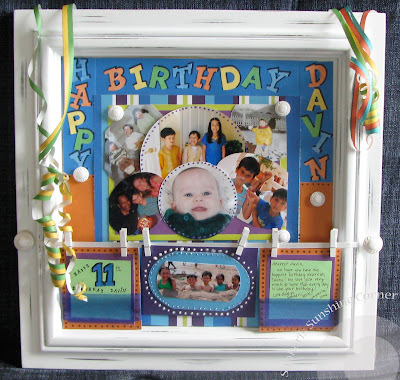 This is an Everyday Display Board from Creative Memories. Its a magnetic board that can be either hung or displayed and can be changed for any occasion (Mother's Day, Birthdays, Christmas, Halloween, etc.) 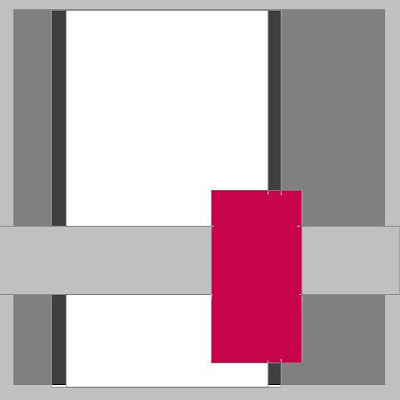 I love making a quick scrap layout. And the best part is that after your done - you can keep it safe in your album. Hope that all of you are well and are enjoying a great Friday. It loos like there is some rain here - hopefully it will clear up soon. Well, we are off on our adventurous road trip - we plan to reach there around Sat. evening. Will post more after our trip. Here is another little thank you card (I don't know why I am so attracted to making thank you cards now :). 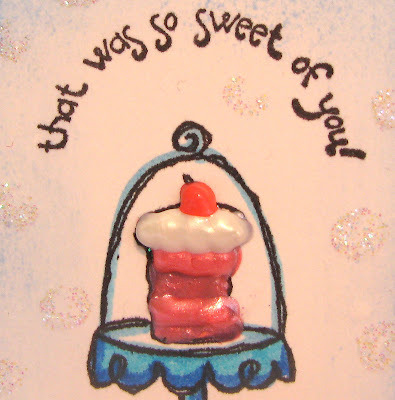 This one is a really sweet one - as the sentiment on the card expresses: "that was so sweet of you". Its really a fun stamp set and I can't wait to make some more cards with it. I hope all of you are enjoying this beautiful Thursday. This morning we awoke to a foggy morning. The air feels cool and crisp and the birds are chirping and the land around us is covered in a gentle fog. Its a beautiful morning in the neighborhood :) Today we have the end of school picnic, filled with fun, food and little pre-schoolers running around with jolly giggles. 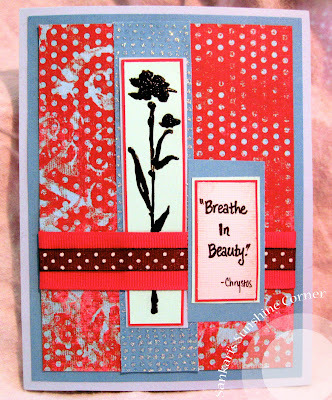 Here is a card that I made for the Rubbernecker Blogger Challenge - which is a sketch challenge. It was a challenge for Tuesdays, but I didn't get around to it till this morning. But I thought that I would still post it, even though its a day late. The challenge was to make a card using this sketch. The texture of the flower is something that I like very much. I am not sure where the paper is from, but the stamps are from SU! The Art of Life. And the background to the flowers has Diamond Stickles. The sentiment from this card came from Chrystos who I had a brief chance to meet at a conference where she read from her book: Not Vanishing. When she signed my book, she wrote "Breathe in Beauty." I have always remembered that and treasured that and it has always inspired me - hard to believe it was almost 13 years ago! How amazing it is to be on this journey of life. There are glimpses during my everyday busy life where I glimpse the infinite and have a chance to breathe in that beauty. Those moments nourish and sustain. Good Afternoon! We woke up to thunderstorms this morning in Iowa. But now the sun is peeking through and its so nice to see how fresh everything looks after a rainstorm. 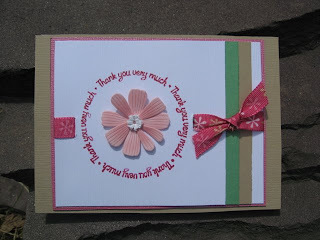 Here is another Thank You card made with a few different elements. 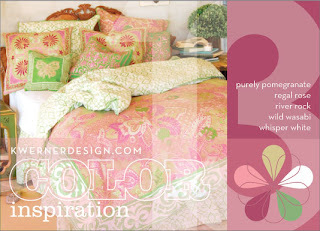 I enjoyed working with the bright colors and especially on this rainy day, it was nice to work with fresh colors. The flower stamp came from SU! 's All the Best set. It was stamped on white cardstock with fuschia ink. The flowers were then cut out and the orange buttons were sewed onto the flowers with yellow thread. I brushed some grass green ink onto the green paper before cutting "grass" onto the paper. I also cut out leaves from the same green paper and attached it to green stems, which I then attached to the flowers. The ribbon is from Offray and onto the ribbon I attached the sentiment from SU! with some metallic turquoise brads. And lastly I added Crystal Stickles onto the flowers which really helped to pop out the flowers. This was such a fun card to make. I love working with bright colors, somehow it is really satisfying. I painted our laundry closet bright pink because I wanted to see a little happiness when I opened the closet :) You can't really see much pink when you open the closet door, but its still there and makes laundry a little more exciting :) Hope all of you are well. 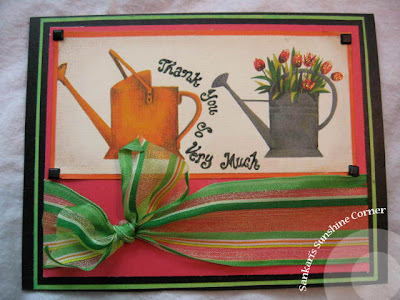 Here is a quick thank you card I put together today that is sans stamps. The card is 5 x 6 1/2. The main paper with the gardening water cans, is from an Italian paper company (I don't know which one) and the other papers and ribbon have been in my scrap pile. The black square brads are from: Spare Parts (Paper Studio) and the flowers have Diamond Stickles on them. I hand wrote the sentiment in Olive from Creative Memories. 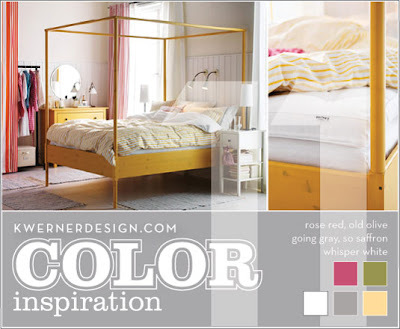 This is not only my first entry in blogland :) but also my first Color Inspiration Challenge entry. These color inspiration challenges are from Kristina Werner who makes amazing cards (catch her on Youtube every Monday for "Make a Card Monday". 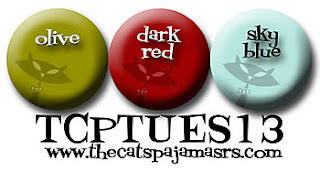 This weeks challenge was to use a swatches of color from the below picture, to create your card. I hope my first attempt at this qualifies and I am so excited to not only do one of these challenges, but also enter it into Roundup. 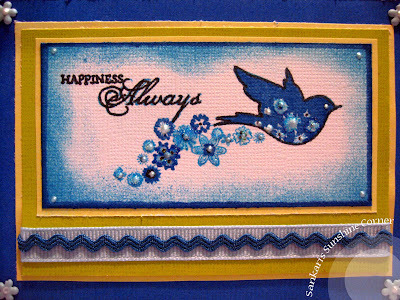 The stamp of the bird is from Inkadinkado and the stamp for the expression is from "Happy Harmony" from Stampin Up!. The ribbon is Ofray ribbon (Blue 1H) and the rick is from Wrights (Croquet Miniatures), Blue Mist. The white cardstock is from Colorbok, and I am not sure where the other DP used is from, nor from where the brads are from. On the flowers in the stamp I used some white paint with "Crystal Effects" Stickles. I am so excited to post this and journey forth into this amazing community of stampers and scrappers :) I would also just like to thank Leigh O'Brien of Sunflower Studio for making me feel so welcome and Maria from Stampin' Inspirations for encouraging and inspiring me. Hope you are all doing well on this glorious sunday morning :) Thank you so much for stopping by today - please come back soon!